My installation "Gestation" explores the tensions that are implicit in social contracts between individuals and institutions, and how these 'agreements' form our identity. Only a fine line separates nurture and control. 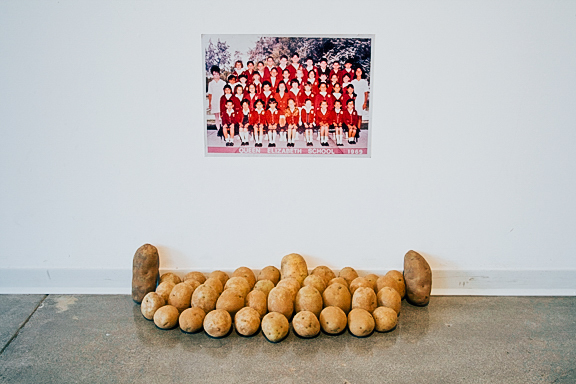 I see the potato as a metaphor for the human being for several reasons: one, the potato is the lowest common denominator of vegetables; two, as a basic staple food, its consumption transcends social boundaries; three, the potato holds energy within, enough to power a radio; and four, its form resembles that of an organ. When I wrap the potato in latex, I ward off the germs, as would a surgeon when exposing the interior of a human body. I hold the object as I sew the protective pouch and I feel like I'm nurturing it, but at the same time I'm confining the object within this simulation of skin. When the potato hangs suspended from the thread, and with the passing of time, disturbances in the clinical begin to germinate. As the latex either melts with the potato skin as it rots within the pouch, or is stretched and punctured by the roots of a growing potato, the latex sheath becomes an index of the often indistinguishable gradations between artifice and nature, decay and life. Rebeca Méndez was born in 1962 in Mexico City. She graduated from Art Center College of Design, Pasadena in 1984 (BFA) and in 1996 (MFA). She has participated in numerous exhibitions worldwide and her work is represented in public and private collections including the San Francisco Museum of Modern Art, The National Design Museum, New York, Denver Art Museum, and Museo Jose Luis Cuevas, Mexico City. Recently her work was exhibited at the Pompidou Centre in Paris as part of the exhibition ‘Morphosis: Continuities of the Incomplete.’ She currently lives and works in Los Angeles. Her research and practice are transmedial and interdisciplinary-as an artist, through her photography, videography and installations, Méndez explores the dialogue between the weather and the landscape as a way to address issues of time and space in relation to human physicality. Considers the journey as medium and travels to Iceland regularly. As a designer, her research and practice focuses on critical reflections on visual communication practices, in particular on brand identity and consumer culture, to encourage formation of independent opinion and participation. Méndez’s art and design research intersect in her study of architecture as interface and interface as a kind of architecture connecting people through immersive spaces, physical objects and systems to local and global networks.